Quench parched hair – without stripping strands – with this concentrated, ultra-moisturising conditioner. Perfect for dry or coloured manes, it ticks all the boxes, leaving locks soft and vibrant via advanced hydrating micro-emulsion technology, strengthening proteins, conditioning extracts and an anti-fade complex. Like all of Pureology’s luscious formulas, this is 100% vegan and scented with a signature aromatherapy blend (containing peppermint essential oil) to soothe both scalp and senses. 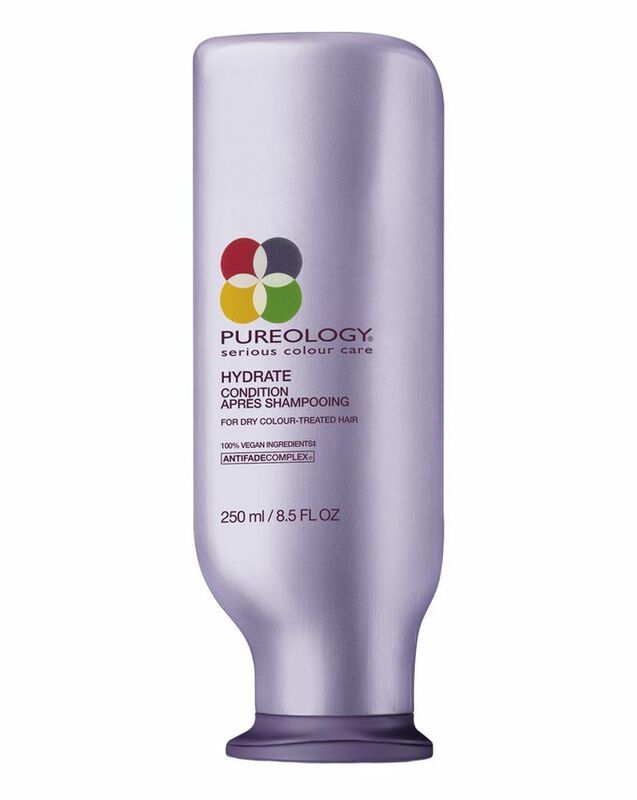 Like an injection of hydration for stressed-out strands, Pureology’s Hydrate Conditioner infuses dry hair with moisture, penetrating the hair shaft to nourish and prevent breakage. Completely sulphate-free, this concentrated, moisturising conditioner will leave medium-to-thick, dry and coloured locks unrecognisably soft, luscious and manageable without weighing it down – it’s suitable for everyday use. Advanced hydrating micro-emulsion technology revitalises dryness and enhances colour radiance, while jojoba, sage and green tea condition deeply. 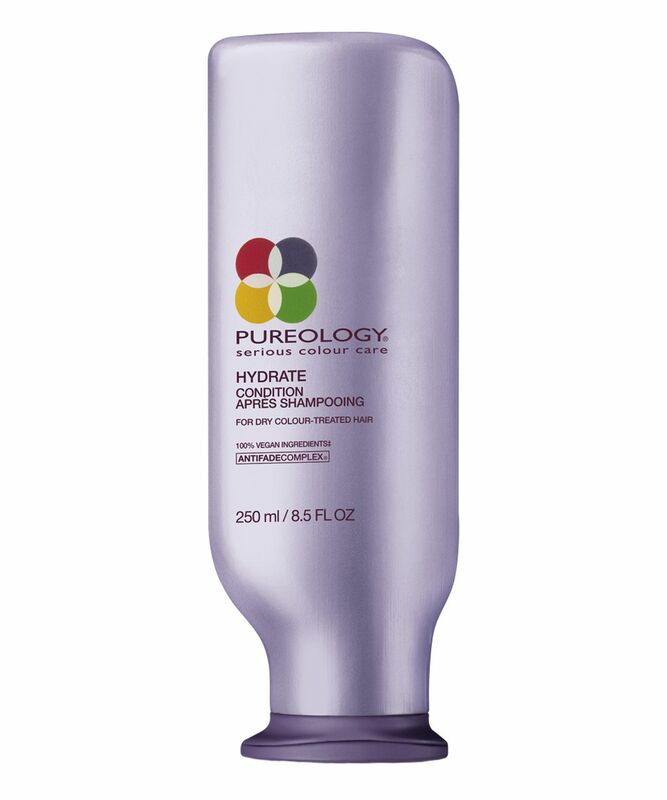 Multi-weight proteins of soy, oat and wheat help to strengthen, rebuild and repair damaged locks and Pureology’s exclusive AntiFade Complex protects colour vibrancy. 100% vegan, the formula is naturally irresistible, soothing both scalp and senses with a signature aromatherapy blend of peppermint and corn mint essential oils. A fail-safe favourite that you won’t want to wash your hair without. Suitable for everyday use. Apply a penny-sized amount after shampooing, lather and rinse. It made my hair silky smooth and really shiny! Considering my straight, fine hair that gets greasy super fast I rarely like and use conditioners, but I'm so pleasantly surprised by this one! Not too fond of minty fragrance and feel, but I can overlook that considering the amazing result. Man. Pureology should really tone down the minty smell.. Overwhelming. I actually got a headache after.. Not repurchasing. Personally, I love it so much!! If you like the smell of uplifting fresh mint and tingling feeling this is it. It’s super refreshing and lifts your mood instantly! :D can’t wait to use it again ohh and it really works magic. My hair went through rough times as I have died my hair 5 times in 1 month time and it works its magic. I did brush my hair for the first time in a very long time without any problem and tears and most of all, was left feeling super soft. Pure love. I'm in two minds about this product. Yes the scent was strong, but I didn't mind it so much. The tingle that goes along with the mint however was just so so uncomfortable for me. I could not wait to wash it off my scalp, it made my skin crawl! However my hair was so soft and shiny and beautiful after using it. I would purchase it again in a heart beat if it weren't for the irritation. This smells like literal paint :( Sadly it did not moisturise my hair at all. I have thick, curly hair, for reference. The mint scent of this is ridiculously strong, I have to open the shower door when using it because otherwise, I feel like I’m choking on a mint. I just love, love, love!!!! this product!!!! It always leaves my hair feeling smooth and soft, I just can't wash my hair without this product. It detangles my hair in seconds and makes it feel so soft and manageable. It's the best hair conditioner I have ever tried. EVER! LOVE IT! And the scent is so refreshing, especially in the summer. I tried the Hydrate shampoo and conditioner. I can't say anything about long term effects, because I only used them once, but from that one time, i'm pretty impressed. The smells are great, personally, I am fond of fresh woody smells. From other reviews, I get the impression that other people didn't like the smell, but I have to say that while the smell is pretty strong, they don't linger and they remind me of professional hair products in hair salons. I have sensitive skin and did not feel any irritation, the mintiness is especially nice during hot summer days, quite refreshing. My hair was left quite smooth, shiny and manageable, I have to mention, that my hair is naturally red and very coarse, so I have trouble finding products that help with the detangling. Overall, this wasn't a miracle, and not the best in the industry, but it works and it's quite good for it's price, I especially enjoyed the smell. Honestly, I feel like this contributed to my hair grow faster. It hydrates the hair so well and doesn’t feel like you need to use so much! Yes, the mint smell is strong but the mint tingle on your scalp is FAB and refreshing plus my hair looks great after using it. This is a must have in my shower now. This did wonders to my damaged hair. This nourished and softened my hair amazingly well and left it light and beautiful. It smells lovely and is very minty on the hair and on the skin. I love it!